Sheltered from weather, books are ready to be exchanged for others. There is much to like and even admire about this little roadside attraction, from the idea itself down to the workmanship in carrying it out. I came across it on a ride on Sunday afternoon, Oregon’s 157th birthday, on a dead-end leg of Grandview Drive in North Albany. 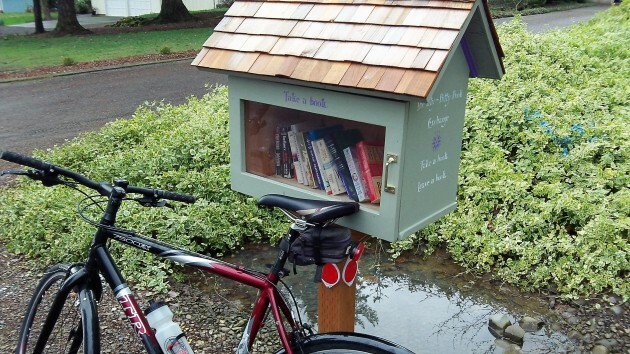 The idea of the “Itty-Bitty Book Exchange” is simple: “Take a book. Leave a book.” Easy to grasp; easy to do. The selection Sunday was necessarily skimpy but nevertheless eclectic, ranging from a pseudo-Tom Clancy item to a Sidney Sheldon potboiler and “The Study of Plant Communities,” which sounds like a sleeping aid for insomniacs. The books are housed in a little … well, house on a study post, complete with wood shingles. Handsomely done. We’ve had up a Little Free Library for almost a year now. Kids books seem to do very well. “Every street should have one”? Bravo to whomsoever took it upon themselves to add the enhancement! I”ve wanted to put up one of these for quite a few years. Maybe this Spring? Noticed much better from a bicycle than from a motor vehicle. Corvallis has lots of them, especially the hilly northwest.